…where the room sounds SO good, all the gear is provided, and you can gain 24/7 access to a professional creative space. Use the 360 photo below to take a look around Nashville’s HOME for Podcasters! With professional grade sound quality, you and your podcast guests and listeners will enjoy the soothing sound of organic conversation. Centrally situated near Five Points, our location serves as an easy meet-up spot for people coming from all corners of Nashville. After the wrap-up, shuffle down Main Street for a hot slice of pizza or mosey on over to your favorite munch spot in East Nashville. For your guests, our spacious studio room has plenty of seats and table space for that special featured guest, allowing a comfortable and relaxed experience for everybody. Not to mention, the vibey interior layout and design optimizes chill chit-chatting. And we even built a custom live streaming system to live broadcast your podcast. Click here if you are interested in live streaming. 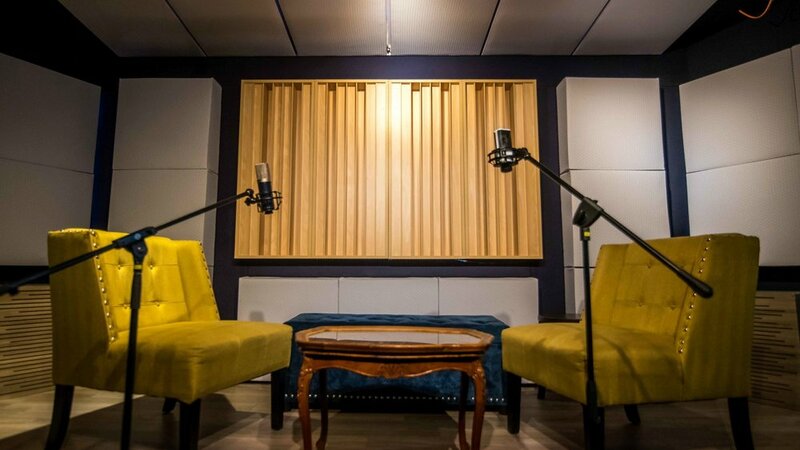 Since the multi-purpose recording studio serves as a space for musicians to create their music, the room is absolutely perfect for musical guests to perform live on the podcast and showcase their talents! With unlimited routing options, you can easily save your recordings to ProTools, or use our DAW system connected to you laptop. Options for mics include Roswell mics, for a warm and classic radio sound, and Lewitt mics, for a bright and transparent tone that is specifically exceptional for podcasts. Sure we can talk the talk, but we can also walk the walk. To listen to podcasts recorded by HOME members, check out Inside The Noize, or The Champagne Way! It’s time to book your recording session hassle-free through our website! Engineer NOT provided, however setup and tracking assistance can be provided for an additional fee. Book us for your next podcast recording!